Prose Media is free to join and use. We charge no platform or membership fees of any kind. 2. Select your desired content type. 3. Answer a few basic questions. Learn more about receiving an instant quote. Do extra or hidden fees ever apply? No. Pricing is based strictly on the content you receive. The flat fee includes everything from writing and topic pitching to editing and revisions. It also covers membership, account management, and all platform needs. No. Order as little or as much as you need. You may place a one-time order for one (or more) pieces of content. Or, you may place an order for recurring content. The commitment for recurring orders is month-to-month (not annual). You may cancel at any time. Please note that cancellations must be made at least 10 days before the end of your monthly billing cycle to take effect for the next cycle. Are discounts available for recurring orders? Yes. 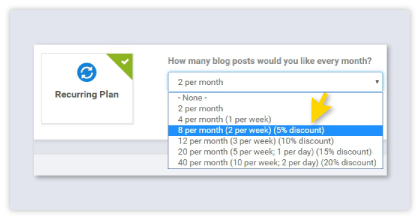 In many cases, a discount is available when you order content on a recurring basis (e.g., two blog posts per week) as opposed to a one-time, à la carte order. If your order qualifies for a discount, that discount will be automatically factored into the monthly total that appears on the screen. Prose wants to give you the best value for top-flight content while ensuring fair payment for our writers. On a macro level, Prose rates are based on industry standards (see the Editorial Freelancers Association) and dictated by the actual market rates of professional freelance writers. On a project level, rates for your specific needs are determined by such factors as: content type (e.g., blog post), word count, turnaround time, frequency, and desired level of writer expertise (Standard, Expert or Premium). We hope that our service is right for you. At the same time, we know that Prose is not for everyone. We specialize in high-quality content from exceptional writers at rates that bring unrivaled value and ROI to our clients. At Prose, your content marketing dollar buys top-tier professional results, and more. Our effective digital system, budget-sensitive writing tiers, and premium benefits like free editorial oversight, make Prose a market leader for innovative, cost-effective content solutions. To learn more about the cost of quality content, we encourage you to check out our e-book on the topic.